As promised, the extra special topping on the Cream Puffs, made with the remainder of my extra special Ghirardelli Chocolate Chips…..Chocolate Ganache! I’ve always loved to watch cooking shows, even when I was young. This was before the days of cable when cooking shows were only found on PBS and long before The Food Network with all it’s popular chefs. I’m sure that puts me into some sort of “nerd” category, but hey…what can I say? One of my favorite shows was called Death By Chocolate, hosted by Marcel Desaulniers. I watched often but the only thing I ever remember him making was Chocolate Ganache. I seem to remember him making it every show, which I suppose accounts for his nickname… “The Ganache Guru”. I was pretty young and the fanciest restaurant I had ever been to was probably Steak and Ale. My idea of a “fancy” dessert was most likely chocolate mouse, so when I first heard him talking about Chocolate Ganache I thought it was probably the most decadent, difficult recipe you could make. As he so aptly demonstrated on my TV screen, it was indeed decadent, however, anything but difficult. 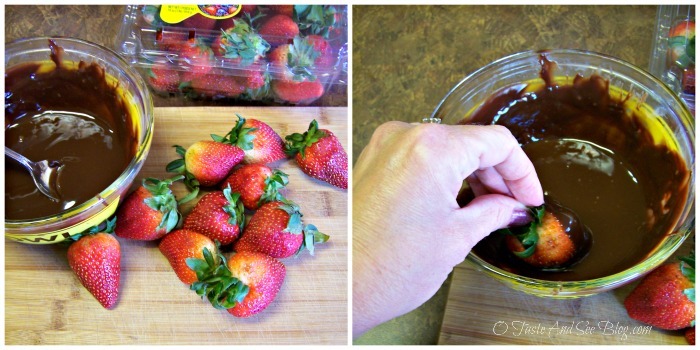 It’s the fastest and easiest way to add smooth rich chocolate sauce to anything! 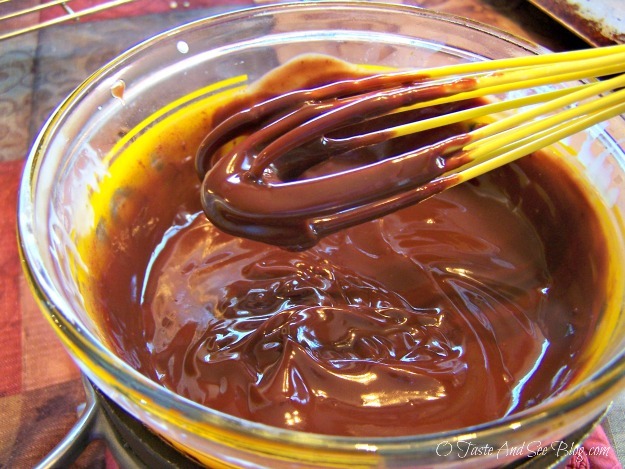 I also learned from him the best way to melt any chocolate…a “do it yourself” double boiler. He would always use a pan with a little water in it, topped with a glass bowl. Every time he melted chocolate it turned out PERFECTLY! That’s when I stopped using the microwave and tried his idea. Now, I too, get perfectly melted chocolate EVERY time! Rich, smooth, shiny Chocolate Ganache…Every time! I don’t recommend this as the standard covering for chocolate strawberries….it dries soft…but it was VERY good! It was Ghirardelli….it couldn’t go to waste! Although, I did “spoil” my dinner. They look so delicious and decadent! HELLO HEAVEN! I may have to try a gluten free version of this recipe! Yum! I love Chocolate. I am going to have to try out your recipe. They are wonderful Paris! Thanks for stopping by, I’d love to know how you like them. Have a great weekend!